One of Asia’s most popular megalopolises, Bangkok offers a diverse range of sights and experiences, with something for everyone. 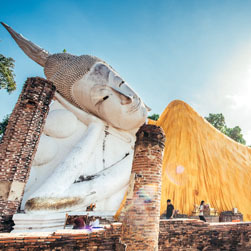 Culture fiends will delight in the dazzling Royal Palace and the city’s countless pagodas, while shoppers could spend weeks sifting through Bangkok’s modern malls and traditional open-air markets. Entertainment in Bangkok ranges from thrilling Muay Thai bouts to highbrow classical Thai music concerts and everything in between. Dining options are equally varied. Whether you’re eating fine French cuisine in a plush hotel restaurant or sampling fried crickets on the side of the road, prepare to have all of your senses engaged. Bangkok has two of the busiest international airports in the region. Suvarnabhumi International Airport is 30km/19mi to the city centre and Don Muang International Airport is 24km/15mi to the city centre.